This has been a long pending post and I felt that this is the right time to bring back some memories from Akshara’s earlier birthday parties. 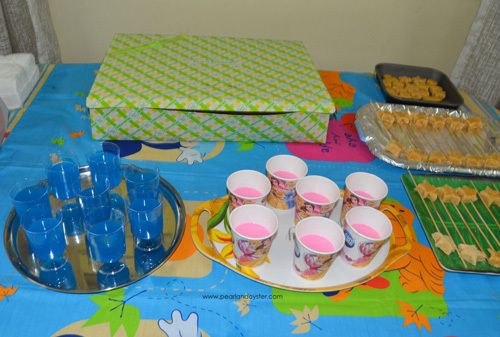 Making the arrangements for Akshara’s birthday party is one of the tasks that I enjoy doing every year. It does take a lot of time and effort from our side but the outcome makes all of that worthwhile. 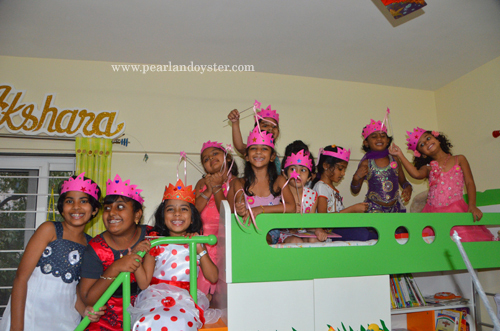 “Why not call a party planner?” may be the question that pops in your mind but believe me, the amount of satisfaction that you get in doing the things on your own and the kids liking them brings a lot of happiness. The hats were made using black chart paper, feathers, glossy tapes. The swords were rolled out of newspapers with a coating of silver paint which gave a real metal effect. Egg cartons used for the cross-guard. 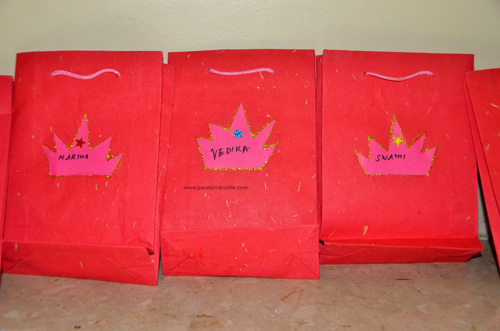 Pink handmade paper was used to make the crowns with satin ribbons and some embellishments. 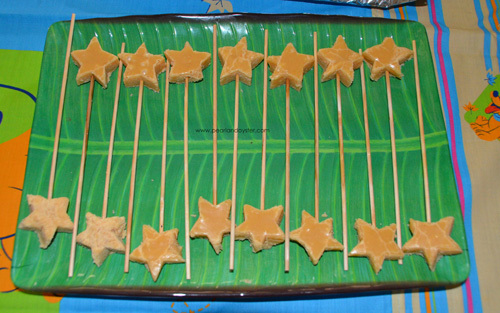 The wand was a simple one made with a chopstick and a pink star. 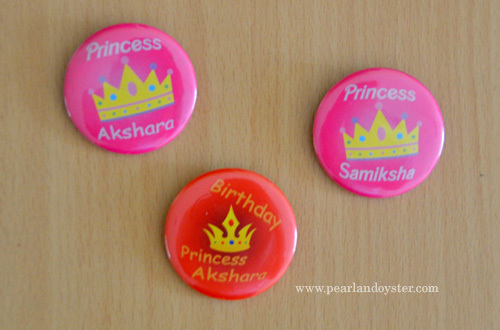 —Princess and Pirate round badges were made to order after some customization with names of the kids. —Pink(strawberry) and blue(citrus blue) drink for the kids. 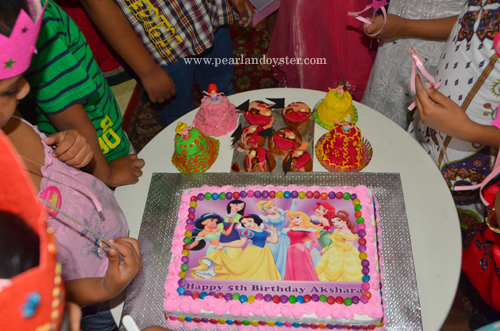 —Princess theme cake, Disney princesses and the Pirate faces. 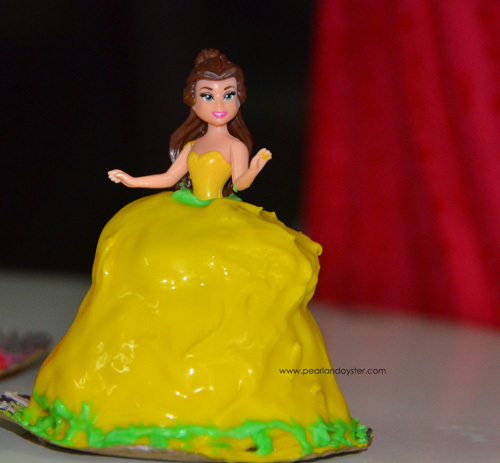 The Disney princesses were made using small cake moulds (for the gown part) and the figurines (from Disney magical moment doll set) inserted into them to get the real look. Of course some frosting and icing in the appropriate colour was done to give the final glow. 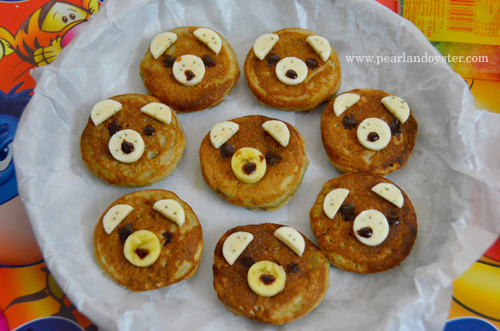 Pirate faces were made using the desired icing on banana muffins. —A mini treasure hunt for the boys. 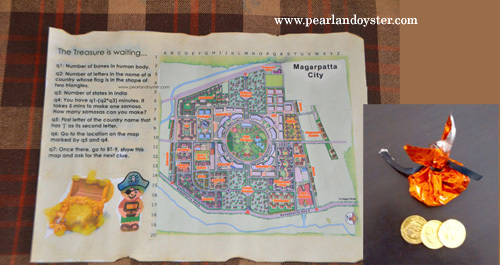 A map was crafted by pouring some tea extract and burning the edges to give a real old, torn look. 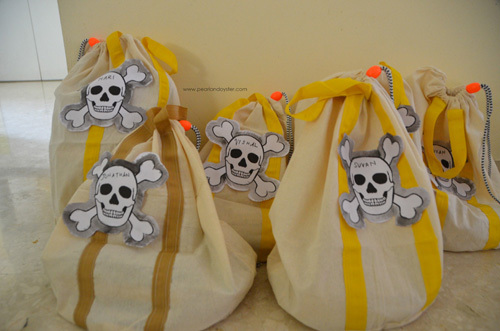 —Return gifts for the Pirates. —Return gifts for the Princesses. 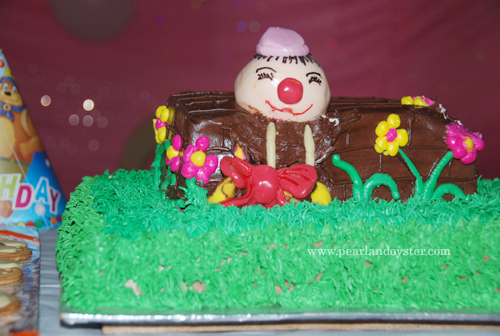 This was the year when Akshara started choosing a theme for her birthday party. 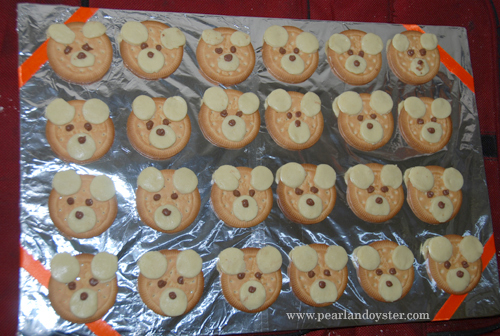 She had developed a craze for teddies and that is how we ended up having a teddy themed party. 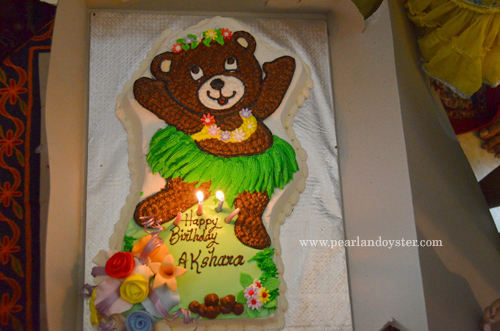 We had ordered a Hawaiian bear design for the cake. 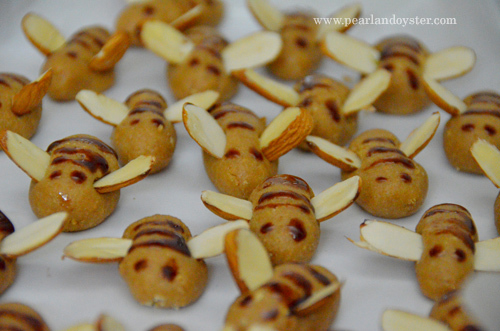 The recipe was quite simple : mix some marie biscuit powder, milk powder and milkmaid to get the body and use slit almonds for the wings. Finally top it with some designs using Hersheys chocolate syrup. 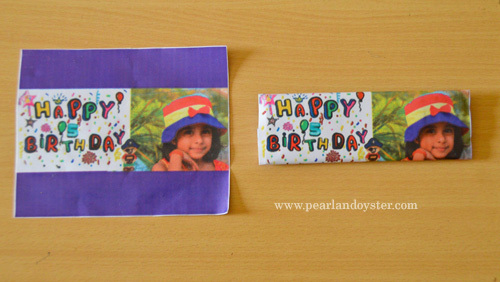 We had planned for some assorted customized gifts like popsicle photo puzzles , photo puzzles piled in a jar, photo frames etc. Unfortunately I missed talking a pic of them. 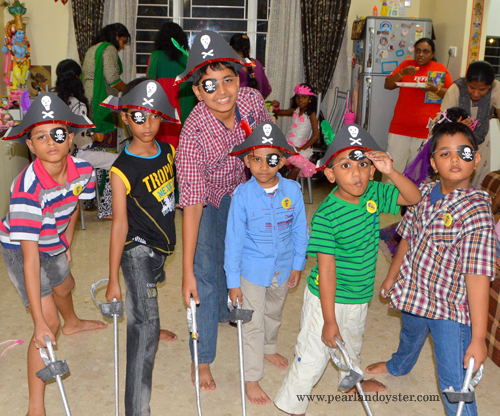 Akshara used to like rhymes a lot and so I came up with the idea of having a party based on it. 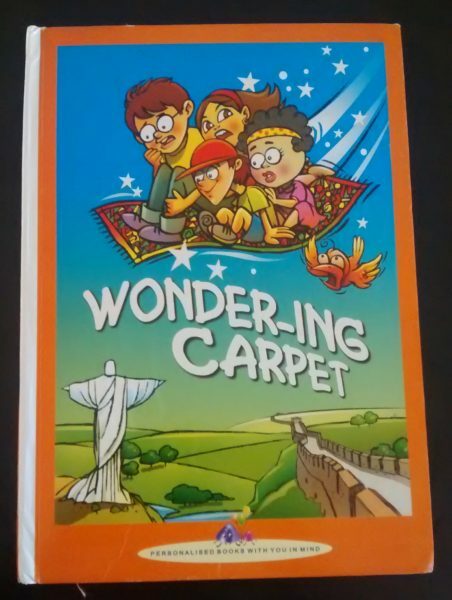 We had ordered customized story books for the smaller kids. 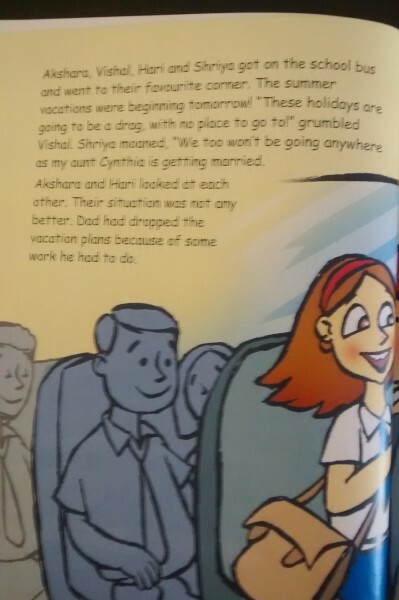 One of the character in the story would be Akshara and the rest of the characters would be her friends themselves. 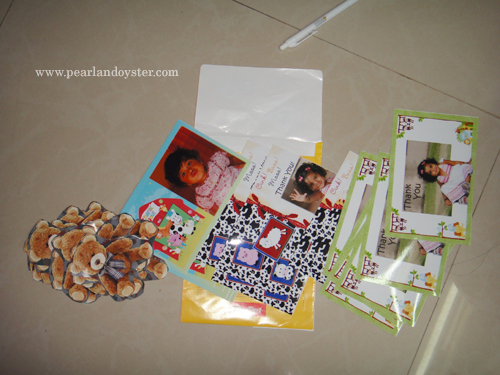 For the older kids we had ordered customized school bag tags with their photos on it. 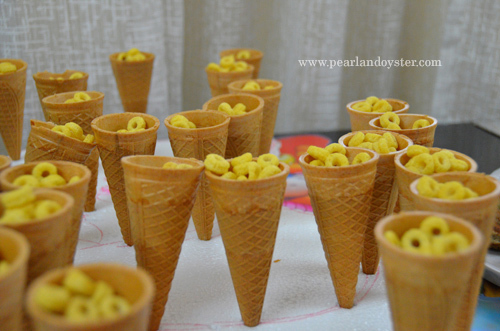 Akshara used to be obsessed with animals and at that age of two she used to call out and make their sounds whenever she spotted them.So we decided to have a farm animals inspired theme party. 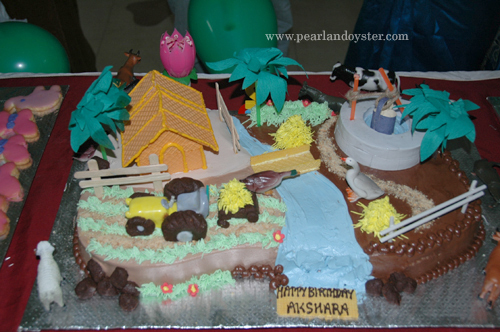 —Farm house with farm animals cake. 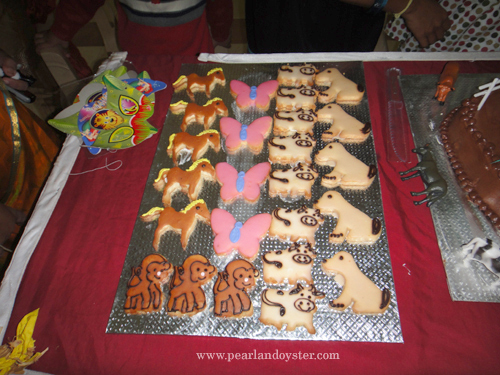 —Made to order farm animal cookies. 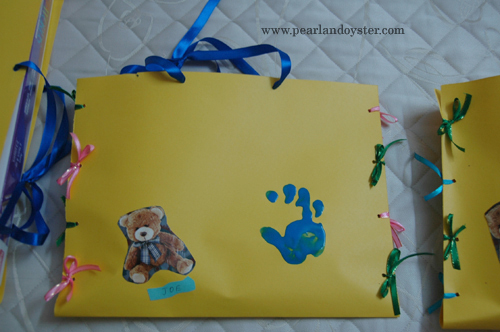 —Home made return gift bags. Next story Hello Brother – A Rakhi for you! Previous story The Smiling Buddha ! Wonderful ideas – beautiful execution . Super ! A perfect decoration of birthday party. The food items are nicely decorated and the kid’s dress code.